I’ll be a faculty mentor, along with Prof. Karen Nakamura and Prof. LaMonda Horton Stallings, for this amazing workshop opportunity @ Yale in May 2016. What are the behaviors, embodiments, and habits of mind that constitute the freakish? How do reactions to divergence—from a nervous giggle to a scream—produce and maintain boundaries of acceptable difference, between assimilation and exclusion? Freaks, as a group designation, has particular salience in colonial histories and empire’s present. The forced relocation of individuals from the colonies to the metropole for display operated according similar logics as later Freak shows. 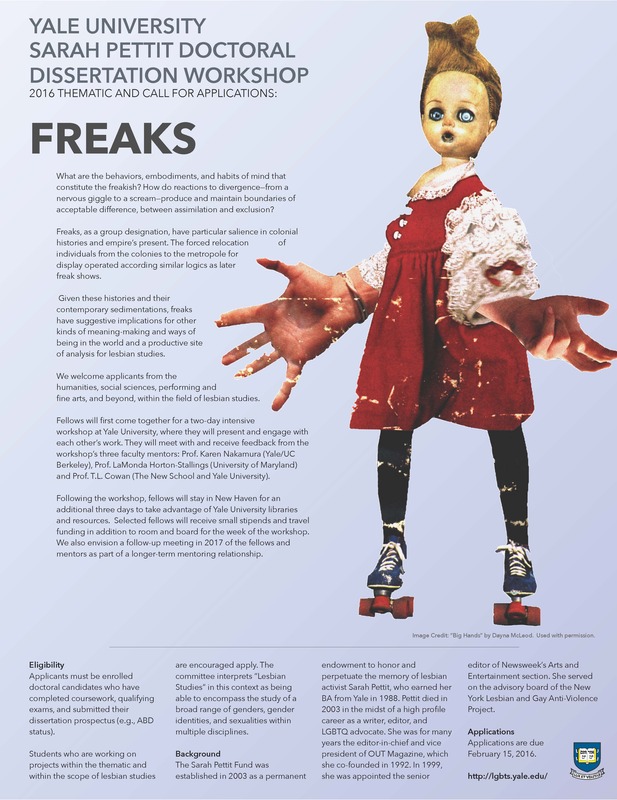 Freak shows and carnivals are spaces of confrontation between putatively “normal” spectators and the entertainment: bodies marked as other by virtue of their race, gender, sexuality, and disability. Given these histories and their contemporary sedimentations, Freaks have suggestive implications for other kinds of meaning-making and ways of being in the world. Fellows will first come together for a two-day intensive workshop at Yale University, where they will present and engage with each other’s work. They will meet with and receive feedback from the workshop’s three faculty mentors: Prof. Karen Nakamura (Yale/UC Berkeley), Prof. LaMonda Horton-Stallings (University of Maryland) and Prof. T.L. Cowan (The New School and Yale University). Following the workshop, fellows will stay in New Haven for an additional three days to take advantage of Yale University libraries and resources. Selected fellows will receive small stipends and travel funding in addition to room and board for the week of the workshop. We also envision a follow-up meeting in 2017 of the fellows and mentors as part of a longer-term mentoring relationship. Applicants must be enrolled doctoral candidates who have completed coursework, qualifying exams, and submitted their dissertation prospectus (e.g., ABD status). Students studying or located in all geographical regions are welcome. However, funds from the Pettit Fellowship may not be able to cover the total cost of travel for many students coming from international locations. We encourage students from non-US locations to apply for supplementary travel funding from their home institutions. Students who are working on projects within the thematic and within the scope of lesbian studies (read broadly) are encouraged apply. The committee interprets “Lesbian Studies” in this context as being able to encompass the study of a broad range of genders, gender identities, and sexualities within multiple disciplines. From 2006 to 2014, the Sarah Pettit Fellowship was run as a biennial fellowship providing a year of support to a graduate student, from an institution other than Yale, who was writing a dissertation in LGBT Studies, with lesbian studies as its focus. From 2016 onwards, the format changed to a biennial dissertation-writing workshop for scholars working on themes in lesbian studies.